HENDERSON — A Gallipolis Ferry man charged with armed robbery in the first degree has waived his right to a preliminary hearing in Mason County Magistrate Court. 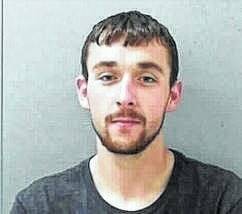 Tyler D. Wamsley, 22, was charged with the March 19 robbery of the Henderson Cafe, a West Virginia Lottery location on Wilson Street. His bond has been set at $100,000 in Mason County Magistrate Court. Now that Wamsley has waived his right to a preliminary hearing, his case has been sent to Mason County Circuit Court for possible further proceedings that may include being heard by a grand jury. The next term of the grand jury meets in September. According to the official criminal complaint filed in magistrate court, a man brandishing a knife entered the Henderson Cafe on March 19, demanding the clerk on duty give him money. The clerk complied and the armed robber got away with less than $200. The clerk told personnel with the Mason County Sheriff’s Department though he didn’t personally know the suspect, he recognized the suspect as a customer who had just left the business minutes before the robbery. The clerk said this customer was about six feet tall, black hair, ball cap and was wearing a black “Eddie Guerrero” shirt that he described as having a picture of the face of professional wrestler Eddie Guerrero with red lettering spelling the wrestler’s name. The customer left and then a few minutes later allegedly came back in with his face and head covered by bandanas but wearing the same shirt. The clerk said he could see the suspect’s short black hair from under the bandana. Tips identifying the suspect’s vehicle led to the clerk tentatively picking Wamsley out of a photo lineup, but the clerk couldn’t be 100 percent certain. Wamsley was arrested on separate, unrelated charges during a traffic stop March 22 and his red Toyota pickup truck was towed. After obtaining a search warrant, a search of the truck yielded a small bladed knife and gray plastic bag. The suspect asked the clerk to place the money in a gray plastic bag. Attempts to secure the video surveillance from the cafe were hampered by “corrosion” on the old system preventing the immediate availability of the images of the robbery. The hard drive was secured by the WV Lottery Commission, which later delivered the footage to the sheriff’s department on May 11. Upon review of the footage, Wamsley was charged with the crime. As of Monday evening, he remained housed in the Western Regional Jail.